Author(s): Behzad Hajieghrari, Naser Farrokhi, Department of Biotechnology, Faculty of New Technologies Engineering, Shahid Beheshti University G.C., Evin, Tehran, Iran. Bahram Goliaei, Departments of Biophysics and Bioinformatics laboratories, Institute of Biochemistry and Biophysics (IBB), University of Tehran, Tehran, Iran. Kaveh Kavousi. Background: MicroRNAs (miRNAs) are endogenous small non-coding RNAs with 18-24 nucleotides in length, which have important roles in posttranscriptional gene regulation. The resemblance of miRNA biogenesis in unicellular green algae and those in plants suggests probable evolutionary conserved pathways. This conservation provides a ground towards prediction of new homologs via computational biology. Methods: Here, conserved miRNA genes in Chlamydomonas reinhardtii and plants were examined through homology alignment. 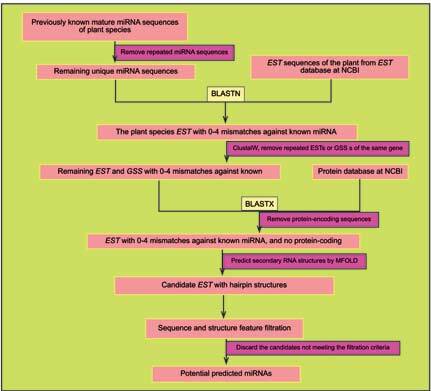 Previously known and unique plant miRNAs were BLASTed against expressed sequence tags (ESTs) and genomic survey sequences (GSSs) of C. reinhardtii. All candidate sequences with appropriate fold back structures were screened according to a series of miRNA filtering criteria. Results: Homologous miRNAs (17), belonging to 9 miRNA gene families were predicted. Interestingly and for the first time, a miRNA family of genes was localized to chloroplast. Again and for the first time, here we report identification of C. reinhardtii miRNA orthologs in plants and animals. miRNA target genes were identified based on their sequence complementarities to the respective miRNAs using psRNATarget against C. reinhardtii, Unigene, and DFCI Gene Index (CHRGI). Totally, 152 potential target sites were identified. From the predicted miRNAs, 7 miRNAs had no target sequence in C. reinhardtii protein coding genes. Conclusion: Identifying miRNA and their target transcript(s) would be useful for other research concerned with the function and regulatory mechanisms of C. reinhardtii miRNAs and helps researchers to better understand the nature of its extensive metabolic flexibility and environmental compatibility to survive in distinct environmental niches and nutrient availability. Keywords: Chlamydomonas reinhardtii, homology search, miRNA, RNA silencing, target gene. Affiliation:Department of Biotechnology, Faculty of New Technologies Engineering, Shahid Beheshti University G.C., Evin, Tehran, Iran., Departments of Biophysics and Bioinformatics laboratories, Institute of Biochemistry and Biophysics (IBB), University of Tehran, Tehran, Iran. Keywords:Chlamydomonas reinhardtii, homology search, miRNA, RNA silencing, target gene. Abstract:Background: MicroRNAs (miRNAs) are endogenous small non-coding RNAs with 18-24 nucleotides in length, which have important roles in posttranscriptional gene regulation. The resemblance of miRNA biogenesis in unicellular green algae and those in plants suggests probable evolutionary conserved pathways. This conservation provides a ground towards prediction of new homologs via computational biology.